We also have a low cost hostel menu for all you budget minded travellers, beautiful sea view dorm rooms and HAPPY HOUR (every day!). We have special events every week. Come join the fun!. Lively and vibrant accommodation in the heart of Duong Dong. With a blend of traditional Vietnamese architecture and modern amenities, Phu House caters to people from all walks of life. We’re located on the main strip in Duong Dong, the centre of Phu Quoc. We’re a short walk from the beach and the famous Rory’s Bar, and next to the local nightclub for those of you who like a late night. 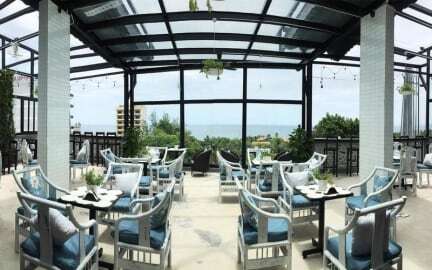 Phu House has amazing facilities; watching the sunset at our Skyline Rooftop Cafe, or dine in our open-air terrace restaurant with contemporary fusion menu unseen anywhere else before. Guests who stay at Phu House get special offers at both our Cafe Restaurant and Bar. Our rooms are cosy and spotlessly clean, you can choose from our private rooms, with own bathroom or a shared bathroom with your own TV, safe and clothes storage. Or you can choose a bed in our beautiful dorm rooms. Dorm beds come with a curtain for privacy, your own plug socket and reading light and secure under bed storage for your belongings, with sea view. All rooms have air conditioning and open out into our internal courtyard. Our receptionists will be happy to help you with renting motorbikes for exploring the many beautiful spots to visit on Phu Quoc, booking tickets for onward travel and will inform you of all the best places to visit, including local insider knowledge of the best bars and restaurants on the island. Don’t fancy exploring by yourself? Take a tour with our tour guides who will take you to the best spots on the island. Choose from many locations, including a trip to the local market followed by a visit to the natural springs and have a BBQ by the river, or go to the beautiful white sandy beaches of Sao Beach. A must visit location for everyone on the island. Great clean hostel, nearby the airport but next to the beach! Clean big dorm with good airco! Beds are a hard but that’s the only thing! Great place to stay! Perfect, clean, Nice staf, perfect beds! The beds where perfect and the hostel was overall very clean. The staff where very sweet and a little bit flirty ;) the only thing is that it was for me not clear it was a party hostel or not. But at the end I was very pleased satified. Q Hao is beautiful hostel close to Duong Dong city. 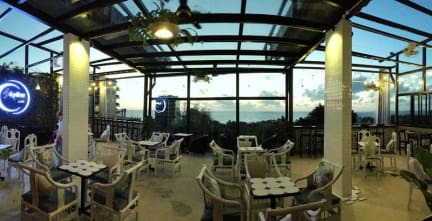 Everything is nice and clean, and the rooftop bar has an amazing view! In eerste instantie was het plan om hier 2 nachten te blijven. Dit hebben we vrijwel verlengd tot 5 nachten. Heerlijke bedden, fantastische douche, netjes, fijne hangmatten, jacuzzi, bar: Zeker een aanrader. Het gebrekige Engels van de medewerkers is een verbeterpunt, maar daar kom ik wel weer overheen. Ik sliep in de basic dorm, wat echt goed is. Verduisterende gordijnen en dus privacy. Een gezellig, mooi en redelijk schoon hostel. We zijn een week gebleven waarin we alleen hebben gezien dat de bedden werden opgemaakt, niet verschoond. Verder fijne kamer met in gedeelde kamer genoeg privacy door gordijnen om bed. Dicht bij strand. Er worden leuke activiteiten georganiseerd, echter wel prijzig. We hebben de pub crawl en boottoer gedaan, Hierbij ontmoet je makkelijk andere gasten. Eten en drinken is duur. Ontbijt is niet inbegrepen maar naast hostel wel goedkoop te vinden. Although the hostel was full the bar was empty all the time because the drinks are way overprized. So not the best place to meet others. Besides, the cleaning ladies would come into the room every morning around 7/8am to clean without keeping their voice down. Very very annoying. Location is fine and beds are comfortable though.